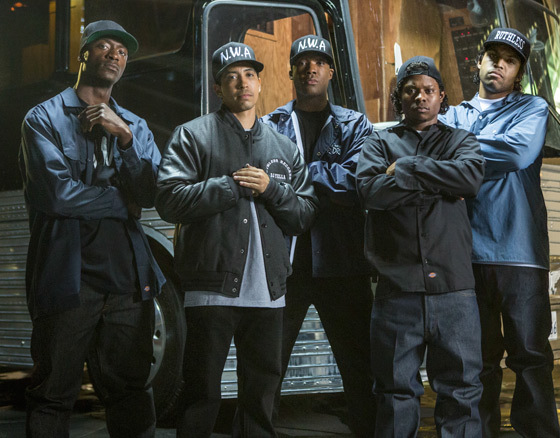 With some of hip-hop's biggest mainstream stars of the past couple of decades already having hip-hop films attached to them, F. Gary Gray's N.W.A biopic is a particularly worthy endeavour, given the seismic influence the Compton, California crew had on West Coast hip-hop and the music industry as a whole nearly 30 years ago. Given that Gray's longstanding association with members of the group dates back to the faux-idyllic narrative reel he helmed for Ice Cube's "It Was A Good Day" and Friday (a couple of famous lines make the script) he was the logical go-to director to helm the story of how the group emerged from their neglected and highly policed environment to report on a reality mainstream America and the world had little awareness or understanding of beforehand. The film centres on how Eazy-E, Dr. Dre, Ice Cube, MC Ren and DJ Yella eventually joined forces with Jerry Heller (duplicitously portrayed by Paul Giamatti) to record the seminal album Straight Outta Compton on Canadian Bryan Turner's Priority Records, virtually defining the West Coast template for "gangsta rap" music in the process and how they dealt with the scrutiny and the fallout that accompanied their ascension to success. Completists may charge that plotlines for MC Ren — who assumed a rapper's rapper status at the group's height — and DJ Yella are unfairly truncated and that the N.W.A and the Posse era of the group are largely overlooked, but we do get to see Dre and Yella's uneasy stint in Lonzo Williams' shiny suit-wearing World Class Wreckin' Cru. These narrative sacrifices in the early part of the film don't detract from the immersive insight we gain into the group's come-up. The cast holds up their end of the bargain here, too, delivering fine performances. Only O'Shea Jackson Jr. (Ice Cube) bears an overwhelming resemblance to the character he's playing (Cube is his father), but Corey Hawkins, as Dr. Dre, does well to convey the inner drive that has motivated the super-producer's well-honed musical and business instincts, while Jason Mitchell's Eazy-E displays the disarming sense of humour that would have been a unifying factor in his role as the group's leader. Gray's inside track into the group's story on a personal level ensures that the film is more than a straightforward biopic of the rise to fame, hedonism and fall narrative, although those ingredients are plainly evident. Grainy clips of the beating of Rodney King are shown several times, and when a band member remarks about the beating being captured on video, the present day debate of police brutality and body cameras surfaces. A sequence depicting the ensuing Los Angeles riots of 1992 serves as a logical and contextual endpoint to the constant police harassment the group members endured and were subjected to in their Compton neighbourhoods, whether they were visiting a friend's house or merely standing outside their recording studio. The ongoing relevance in these scenes is overwhelmingly palpable. Gray, however, is less successful in reframing women in a contemporary way. While Eazy-E's widow Tomica Woods-Wright (one of the film's producers) and some of the other wives and love interests of group members are given short scenes to demonstrate their agency, the primary role of women in the film to serve as eye candy. This is underlined in an overtly sexist scene in which, in an attempt at comic relief, a woman is jettisoned from a particularly bawdy after-show party when her boyfriend shows up. The disintegration of the group members' relationships, primarily over money and contracts, is highlighted by the sequence featuring Ice Cube's merciless "No Vaseline," his infamous diss track to the remaining members of N.W.A after he embarked on his solo career, and the emergence of Suge Knight, Snoop and Death Row Records in the life of Dr. Dre. But the remaining message of remaining a brotherhood despite their differences is underlined by the handling of the death of Eazy-E from AIDS, just as the group were in the process of reforming. As the film does when it shows the effects of the death of Dr. Dre's younger brother on the producer and the group as a whole, Straight Outta Compton succeeds in lending complexity and humanity to their characters. N.W.A were conveniently and stereotypically portrayed as caricatures at the height of their success, but the film necessarily recasts them as previously unheard individuals with the right to raw and uninhibited self-expression.